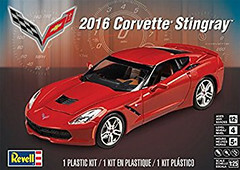 For the Modeler: This review covers the 2016 Corvette Stingray kit by Revell. 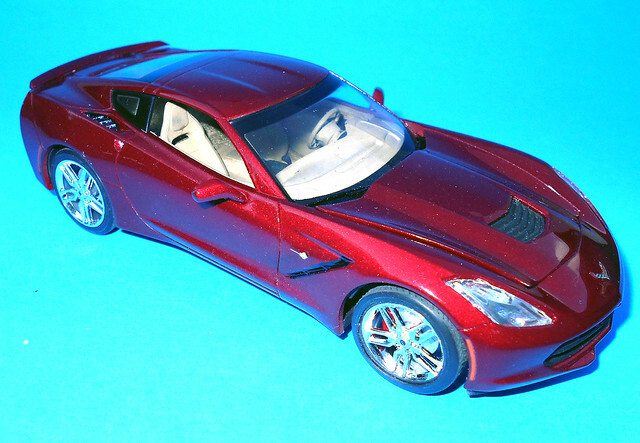 It is Kit #85-4425 in the current catalog and is a new mold as it is a new model of a current car. Some common parts from the 2014 kit as those actual parts haven’t really changed much, but the box is dated 2016. This is a Skill Level 4 kit as it requires glue and paint and age recommendations are 12 and up. The kit has 57 parts molded in White, Clear, Chrome and Clear Red and it has soft rubber tires with metal axles. The decals are the waterslide type providing basic badges, marker lights and dash gauges. The instructions are typical Revell book format with full paint callouts and detailed pictures for building. The overall build is easy as this is a low parts-count kit, but fit and finish is excellent. The motor is simplified but very little of it can be seen anyway. The interior is well detailed and looks nice once finished. The exterior was clean and free of blemishes. Overall dimensions are ~: Length: 7″, Width: 3¼”, Height: 2″.